Partnering for Green Growth and the Global Goals 2030 (P4G) brings together governments, businesses and civic society organizations in innovative public-private partnerships to advance solutions to humanity’s greatest needs within the following sectors: food and agriculture, water, energy, cities and circular economy. 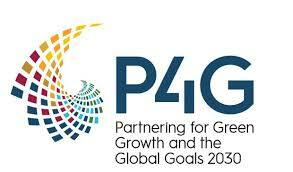 P4G works in partnership with countries and global organizations addressing sustainability issues. P4G’s initial partner countries include: Chile, Denmark, Ethiopia, Kenya, Mexico, South Korea, and Vietnam. Partner organizations include: the Global Green Growth Institute, C40 Cities, the World Economic Forum, and the World Resources Institute. Other countries and partners are expected to join P4G in 2018. P4G works with its partners at the global, regional and national levels to identify public-private partnerships that present solutions to humanity’s greatest needs as related to food, water, energy and sustainable development. P4G then offers facilitation and/or co-funding support and recognition to these partnerships to help prove the validity of a business model, launch a pilot or accelerate growth to create a sustainable venture. P4G also convenes government, business and civil society leaders at events such as their biennial summit, meetings, workshops and webinars and share knowledge through publications. P4G will advance partnerships which create systematic change that can be scaled and replicated to drive sustainable economic growth. P4G partnerships will promote innovative approaches to solve important challenges in five major categories of sustainability: food/agriculture, water, energy, healthy cities and the circular economy. It is solely dedicated to this mission for at least the next five years with plans to continue this ideally to 2030. The national platforms provide a strong place-based foundation for the development of a pipeline of P4G partnerships.